The art market is constantly and rapidly changing; globalization and digital innovations have transformed how art is viewed, bought or sold. Arts professionals must be able to anticipate and forecast these changes and also learn the rules of this fascinating game. The series Art Studies Online help learners of all categories understand how the art market is an important, dynamic, and growing branch of the cultural and creative economy, describing its complex structures and influential actors. We offer a range of courses, running at several levels, from introductory to more specialised coverage. Some courses invite you to learn more about the art world so that you can navigate this ecosystem composed of galleries, artists, art fairs and more. Other courses cover more professional subjects such as finance law or marketing. Within these areas we are developing further more specialized field of study. Unlike other courses, they are completely flexible. You can start at any time and complete at your own pace. All you need to do is to sign up, choose your course option, and register. There is also the option to have more individual tuition and develop research and writing skills. 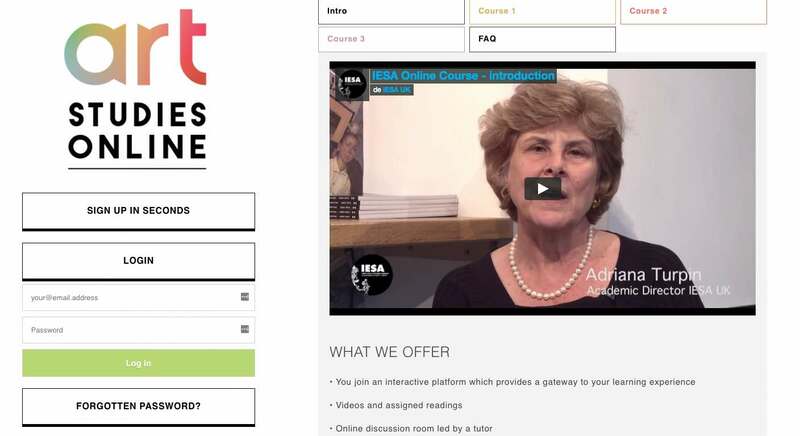 For a small additional fee, individual assignments and tutorials are set, marked and discussed by the course tutor. Students taking this option will gain ECTS (European Credit Transfers) delivered by IESA, Paris. Join our courses today and explore the art world anytime, anywhere. To subscribe click here. If you want a preview of our programmes, scroll below and listen to the videos. They will tell you about the course tutor and give you an outline of each course.